I’ve always liked the hardy sedums. No matter how callously treated they remain reliable, easily propagated and drought tolerant. Withhold water and many species will respond by coloring up. Colder fall and winter temperatures have the same effect. I lost track of this pot and discovered it tucked under another plant. Neglect brought out the deeper red tones — on the leaf edges of the spathifolium and just about replacing all the green on the album — making both plants the perfect foil for the terra cotta pot and surrounding beach strawberries . 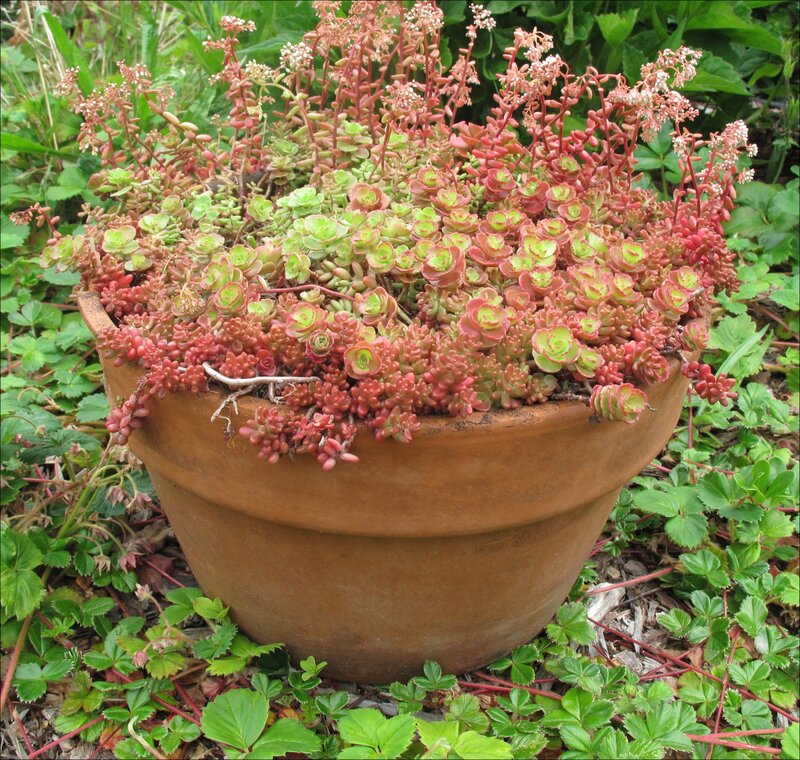 The two sedums: probably album ‘murale’ and an unknown spathifolium cultivar, are turning red in June, not from cold weather, but probably in response to water deprivation. The spathifolium is a native of Oregon. The album ‘murale’ is just now sending out stems topped with buds that will turn into tiny white flowers in a week or two. 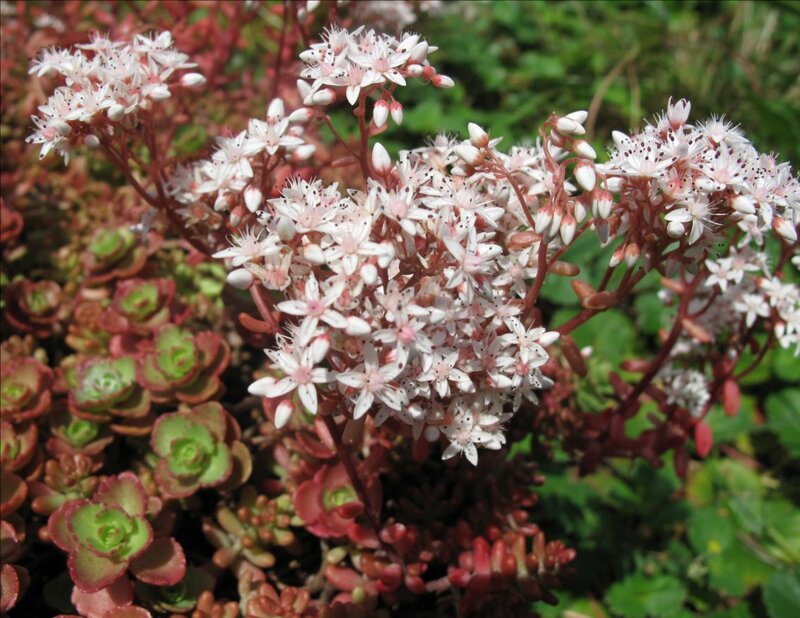 Most of my hardy sedums bloom with either white or yellow flowers in late spring and summer. Red leaf tones provide reliable fall ground cover color. Occasionally, like this summer, I was only a blue Campanula away from having an appropriate Forth of July pot. LIke most of the hardy sedums, propagation is a breeze. Break off a piece of the plant and leave it laying about. No need to even put it in soil immediately (though that’s fine too). In a few days tiny roots will appear. 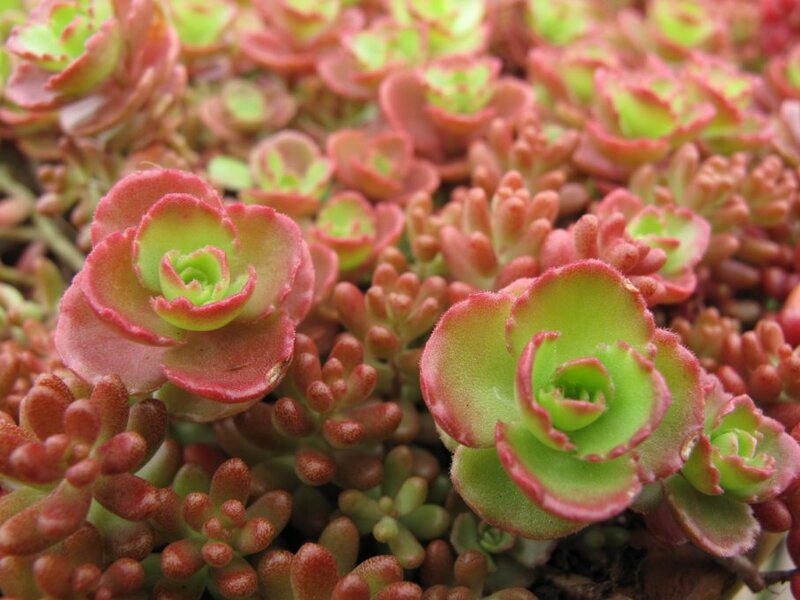 This entry was posted in Plant Picks and tagged hardy sedums, Sedum album 'murale, Sedum color, Sedum spathifolium by Bart Arenson. Bookmark the permalink.